On October 19 Australian label Future Classic shared the video for electronic producer Christopher Port's "Everything in Quotes "DARK"." The video is a stylish mixture of shots of brightly lit models and text scrolling down and across the screen. You can see it above. 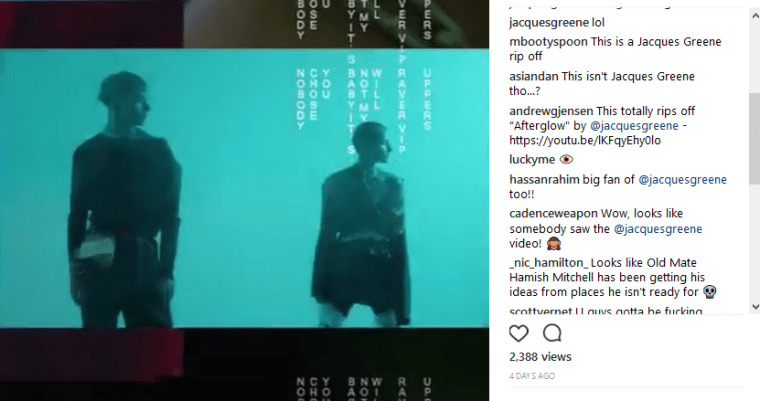 However, Canadian producer Jacques Greene called the video out on October 23, accusing Port and his label of having copied his own "Afterglow" visuals which employ a very similar style. Greene has also used similar fonts and images to promote his 2017 album Feel Infinite, including its cover. The similarities were also spotted by fans of Greene on Instagram. Greene's label LuckyMe subsequently pointed out multiple occasions in which they felt the Feel Infinite artwork and branding has been copied since its release earlier this year. This included a Nick Jonas single cover and the art for a Dior Homme collection. Approached for comment by The FADER, LuckyMe founder Dominic Flannigan gave the following statement. "This is just a symptom of the internet and we’re flattered this record had resonance. Every image Hassan Rahim, Jacques Greene, Mathieu Fortin and Mauries Matos created was an original to evoke a life flashing before your eyes - small moments served as metaphor for human phrases in this euphoric music." "Culture is a conversation and we sample abundantly. The whole artwork issue is somewhat ironic given we literally gave away every stem on the record in an acknowledgement of sampling and creative commons. There are countless remixes online made from this album. We believe no one owns a damn thing outright and that ultimately the free distribution of these ideas are very important to protect. You can’t point at anyone and say where inspiration starts and stops. If someone makes a show flyer inspired by our work [then] it helps the club culture that the record was about. No problem there. Brands or major label acts lifting our work have unfortunately become a part of operating as an independent label over the last 10 years and we’ve given up shouting at the sky about it." "We’d claim Jacques Greene’s interactive video for "On Your Side" inspired prints on Raf Simmons S/S 2015. This is nothing new here. Those who matter tend to notice it and we understand our work has value. We continue to evolve and make defining work. But proximity and context to the original is important, and if you share audiences with us and we influence a commercial project — give us some credit and let us all grow together. That’s it." Reps for Christopher Port and Future Classic were not immediately available for comment.